Some of the most common questions we get from people looking for mobile equipment rentals are, "What kind of power does the system need?" and, "Where are the ethernet connections for internet and phone?" If you're about to embark on the search for your next mobile imaging solution and one (or both) of these questions crossed your mind, we've put together the short video below to get you the answer. Not every trailer is designed exactly the same, and the trailer in the video contains a CT scanner, but most trailers have a similar design to what you'll see here, regardless of manufacturer or which equipment modality is inside. 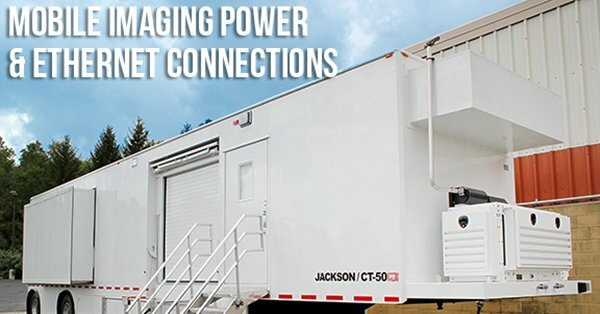 Click on the video below to see what kind of power connection a mobile trailer needs and where the ethernet connections on a mobile trailer are typically located. If you are about to jump into the market for your first PET/CT scanner, you are also about to step headlong into a veritable sea of options, accessories, and price points. Before you get started, there are a few questions you should have at least tentative answers to. 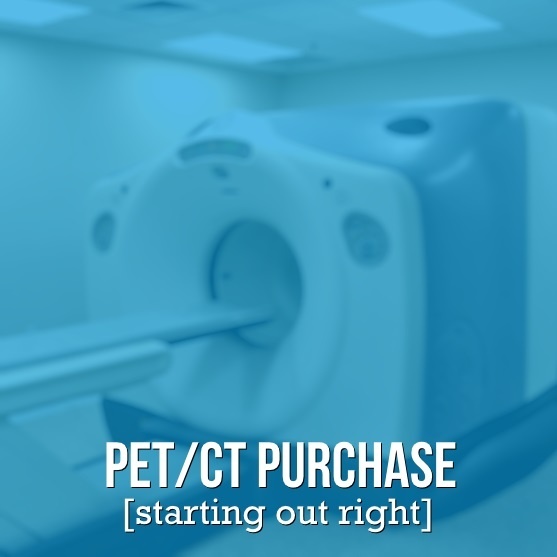 We originally posted these PET/CT buying questions questions in 2015 and, in the time since, have continued to use them in guiding buyers to their best equipment fit. If the search for your next PET/CT solution seems overwhelming, answering these three questions will get you started in the right direction. 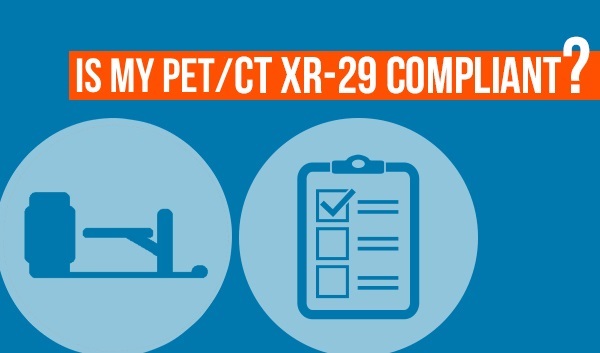 If you own or operate a PET/CT, the moment you heard about NEMA standard XR-29 for CT scanners, your eyebrows, your ears, and the little hairs on the back of your neck probably all shot up in unison, and you thought: "Does that apply to my equipment too?" Since we originally published this article in 2014, current and prospective PET/CT users have continued to ask us this same question. Back then, there wasn't a lot of clarity to be had. Now, however, with XR-29 non-compliance penalties in full swing, the answers are in the open. Watch the brief clip below for an explanation of how NEMA XR-29 affects PET/CT equipment. In the continuous effort of medical imaging manufacturers to push their technology forward, improve patient and doctor experiences, and remain competitive in the marketplace, Philips has released a newer generation of their PET/CT product: the Ingenuity TF. The new scanner is, in some ways, an advancement of their Gemini TF PET/CT scanners. The question is: In which ways is it an advancement, and do those advancements make it a "no-brainer" upgrade for facilities looking to balance clinical performance and capital costs? To help you know the difference, we've compared these two PET/CT systems below. You'll see what's the same, what's different, and how the value proposition shakes out between the Gemini TF and the Ingenuity TF. The Philips Gemini PET/CT line is now three generations deep. 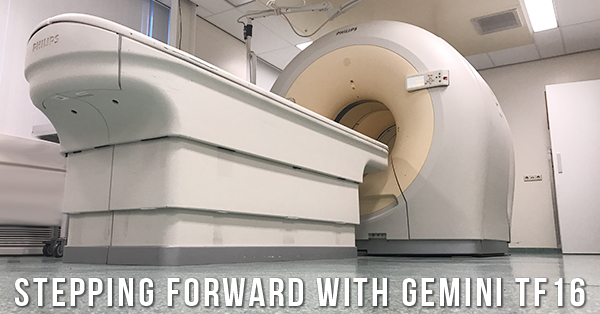 From the Gemini Dual and 16 Power, to the Gemini GXL, to the Gemini TF, Philips has been improving the image quality and detection accuracy of their PET/CT equipment every few years. Sometimes, these changes come quickly enough that, unless you keep your ear to the ground on all things tech, a new iteration can be easy to miss. Since we know many of you are too busy serving patients, building practices, and managing imaging departments to monitor the equipment industry constantly, we've taken care of the legwork of comparing the last two Philips PET/CT models to emerge on the secondary market for you. 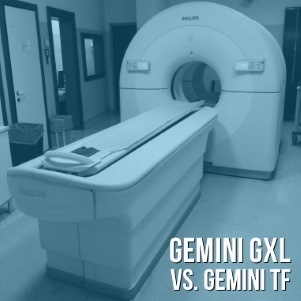 Below you'll find a comparison of the Gemini GXL and the Gemini TF. You'll learn what they share, how they differ, and where each one shines. Looking for your next PET/CT right now? Click here to tell us your needs and get a quote!